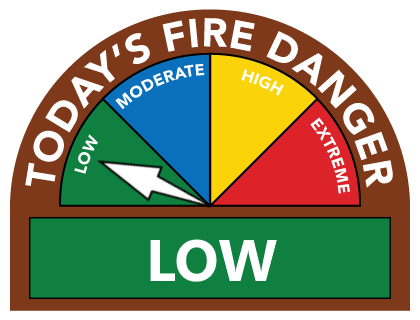 Burning is allowed during daylight hours and the ventilation index is above 400. NO BURNING IS ALLOWED During a declared fire season or when a total burn closure is in effect. Yard trimmings, leaves and brush only. There can be no open burning of any wet garbage, automobile parts, petroleum based products such as tires, roofing materials and plastic containers. Animal remains or animal/vegetable matter resulting from the handling, preparation, cooking or service of food is also prohibited. Any other material which normally emits dense smoke/noxious odors is prohibited. 1. Not less than 15 ft. when burning is conducted in an approved burning barrel. 2. Not less than 25 ft. when the pile size is 3 ft. in diameter and 2 ft. or less in height. A garden hose connected to a water supply or other fire-extinguishing equipment (5 gallon buckets of water, shovels, fire extinguishers with a minimum 4-A rating) shall be readily available for use at all burning sites. These regulations cover residential burning only and are not valid for the burning of commercial or residential land clearing, debris and/or slash burning. Burning must be conducted under constant supervision of a person capable of taking corrective action. Fires Must be extinguished if conditions develop that would cause fire to spread. *Before burning please call 673-5503 option 1 to verify it is a burn day. Violations of the burning requirements may result in the issuance of a citation or civil penalty and/or suppression costs. If you have any questions. please contact Ray at 673-5503, ext. 305 or click here to send Ray an email.